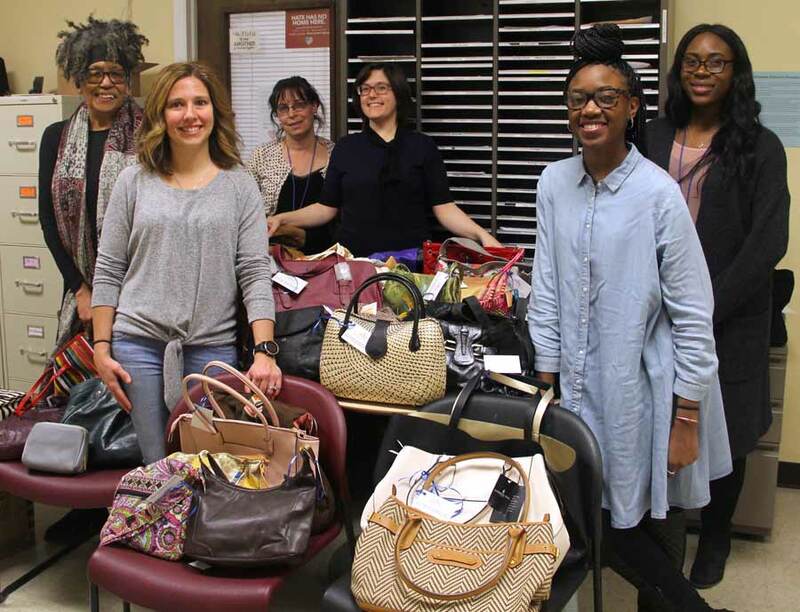 Junior League of Evanston-North Shore members gathered on January 29 in Northfield to fill more than 250 purses that have been collected over the last several months as part of the organization’s “Purses with a Purpose” program. The purses were filled with toiletries, also collected from the community, and vouchers for the JLE-NS Thrift House in Evanston. This is the second year the organization has conducted this program. “Purses with a Purpose” was met with overwhelming success from both the organizations that were recipients and the members of the community in its first year. 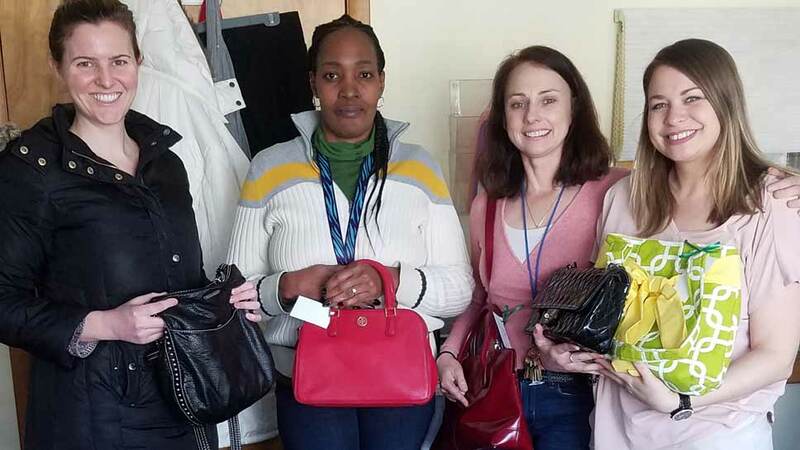 The filled purses were distributed to clients in local homeless and domestic violence shelter, including transitional housing, throughout the greater North Shore and northern Chicago area. The JLE-NS prides itself in its mission of supporting women and families in need within the community. Through this program it is able to provide purses filled with necessities and hopefully a bit of encouragement through boosting their self-esteem, possessing new items, and providing care for themselves. JLE-NS supports the following agencies through Purses with a Purpose: Waukegan Township’s Staben House, WINGS, Howard Area Community Center, Lake County Haven and Sarah’s Circle. Many community partnerships were created during this project as purses and toiletries were collected through Make a Difference Day and the Volunteer Center, Christ Church in Winnetka, Northview Dental Associates, Kate Spade, and countless JLE-NS members and individuals in the community. Junior League of Evanston-North Shore member Alisha Liu (left center) of Winnetka, with members of the Howard Area Community Center receiving Purses with a Purpose for their domestic violence survivors program. PHOTOGRAPHY BY Rachel Hoffman, Howard Area Community Center. Junior League of Evanston-North Shore member Jamie Kephart (left) of Mundelein delivers Purses with a Purpose to members of Lake County Haven in Libertyville. About the League: Junior League of Evanston-North Shore (JLE-NS) is a women’s organization committed to promoting voluntarism, developing the potential of women and improving the community through the effective action and leadership of trained volunteers. Since 1924, JLE-NS has contributed more than $3.2 million to Chicago’s North Shore community and its 275 members serve an area that extends from Evanston and stretches to North Chicago. With an emphasis on advancing employment and supporting families, the JLE-NS fosters job readiness and promotes positive family development through ongoing projects, such as the Evanston resale shop Thrift House, Job Readiness Day, Fitting Futures and The Designer Kitchens of the North Shore Kitchen Tour. The JLE-NS is a member of the Association of Junior Leagues International (AJLI) with 291 Leagues globally. JLE-NS membership is open to any woman with an interest in and commitment to voluntarism.